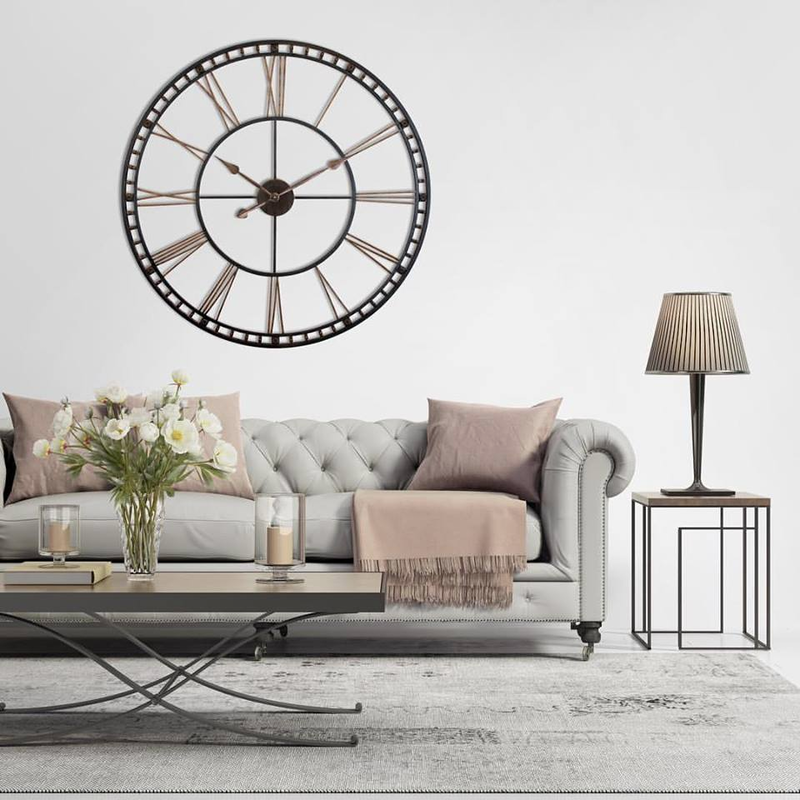 We offer an impressive range of modern wall clocks that are highly sought after by those sprucing up the walls of a chic suburban villa, a trendy sky rise condo or an urban cottage. An exposed gear clock, a metal wall clock or an extra-large digital wall clock will add a pop of punky modernism to your pad, while a large rectangular wall clock gives the illusion of a taller or wider space. 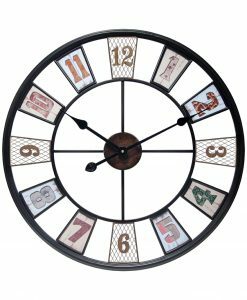 Kaleidoscope Decorative Round Wall Clock 23.5 in. 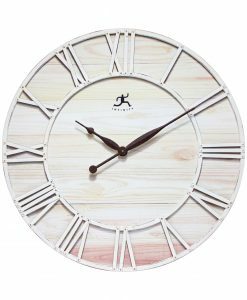 Fusion on Wood White Wall Clock 27.5 in. 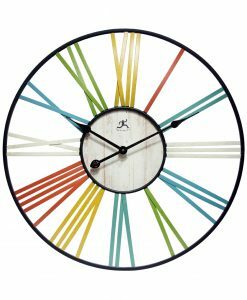 Windmill Multi-Color Wall Clock 24 in. To achieve a bedroom inspired by traditionalism or vintage motifs, we recommend supplementing your walls with a metal wall clock and other types of home décor accents that exude an old world charm. 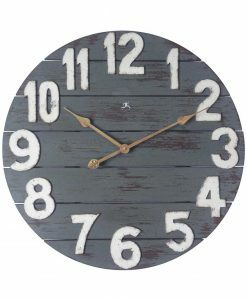 Vogue Gray Wall Clock 12 in. 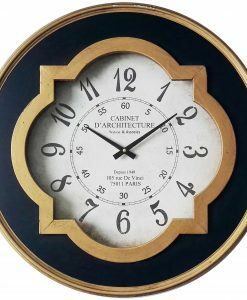 Vogue Ivory Wall Clock 12 in. Franc Silver Wall Mirror 17.5 in. Wirral White Wall Mirror 24 in. Farmhouse Gunmetal Wall Mirror 32 in. Many designers and decorators say that the kitchen is the heart of the home which is why the decorative accents you choose to display in yours should be carefully considered. Have a huge kitchen wall that needs something equally eye-catching to match its expansive size? If this is the case, one of our giant kitchen wall clocks is just what you need. 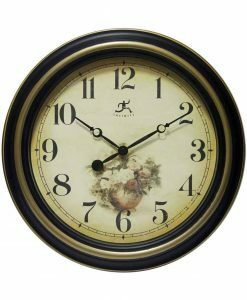 Fabrizio Antique Brown Wall Clock 12 in. 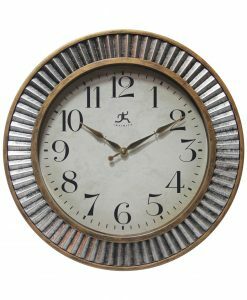 Lexington Avenue Grey Wall Clock 15 in. Focus Black Resin Wall Clock 8.75 in. 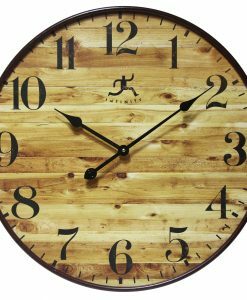 Marbled Mocha Wood Wall Clock 27.5 in. 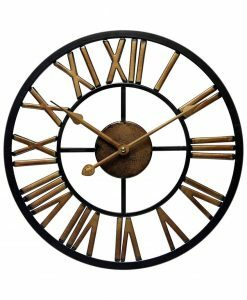 Walnut Resin Wall Clock 14 in. The simplest way to add a touch of decorative disposition to your space without emptying your wallet is to hang one of our outdoor wall décor items. If you only want to modestly upgrade your outdoor décor to keep up with the trends of today or create a cozy environment ideal for backyard entertaining, display a chic metal wall clock or rustic thermometer. Churchill Silver Indoor/Outdoor Wall Clock 18.5 in. Indoor/Outdoor Brown Thermometer 12 in. Stone Slate Indoor/Outdoor Wall Clock Thermometer 10.5 in. Executive Black Thermometer Outdoor/Indoor 12 in. Are you looking for the perfect clock or mirror for your bathroom? 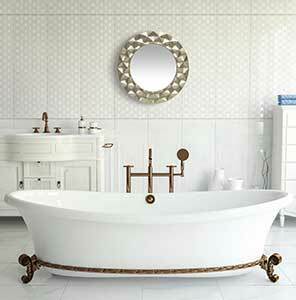 Check out our section designed specifically to help you find the perfect bathroom decor. Glam Silver Decorative Wall Mirror 18 in. 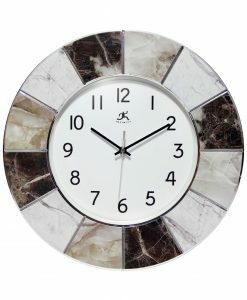 Modern Marble Multi-Color Wall Clock 16 in. 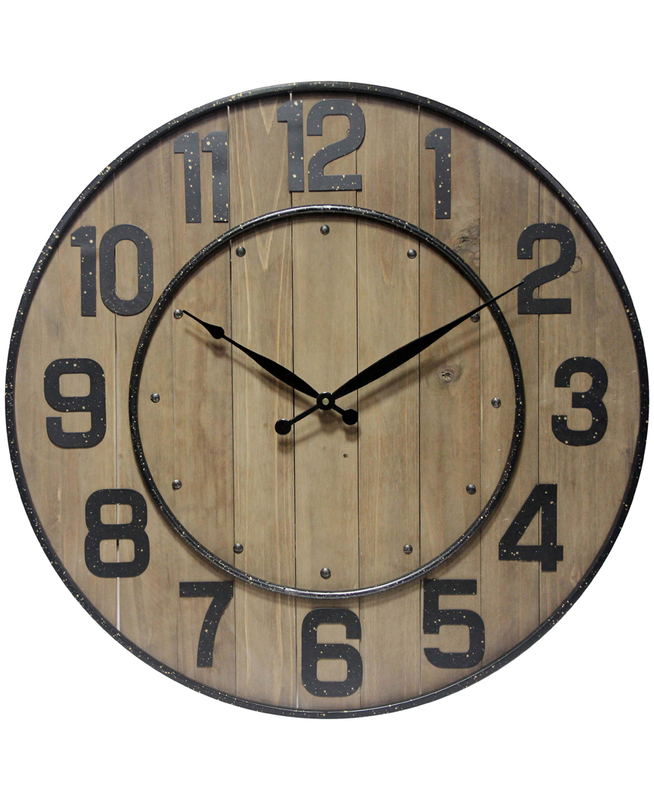 Wine Barrel Brown Wall Clock 23 in. Elegance Silver Wall Clock 17.75 in. 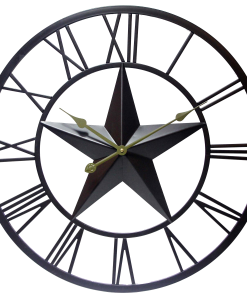 Harbor Decorative Wall Clock 15.75 in. 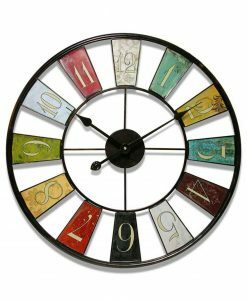 Wagon Wheel Multi-Color Wall Clock 27 in. 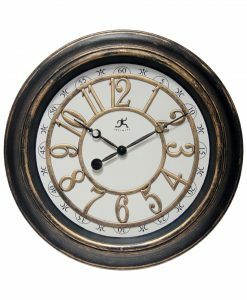 Ruche Aged Gold Silver Wall Clock 16 in. 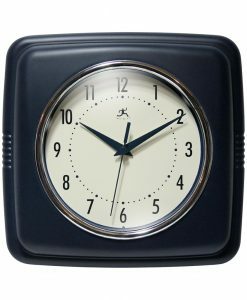 Retro Blue Resin Square Wall Clock 9.25 in. 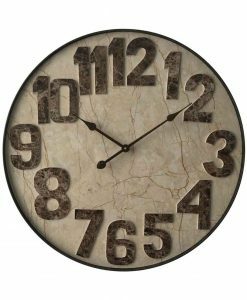 Retro Slate Resin Square Wall Clock 9.25 in. 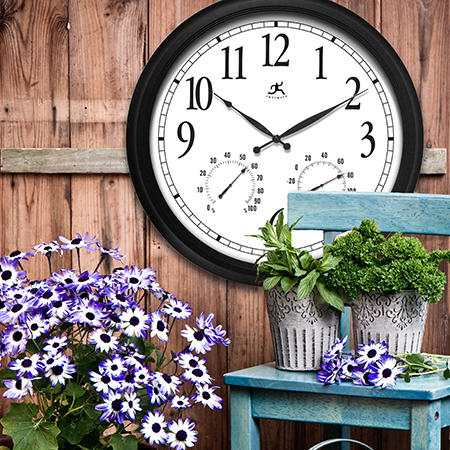 Blue Aluminum Wall Clock 9.25 in. Saffron Yellow Aluminum Wall Clock 9.5 in. 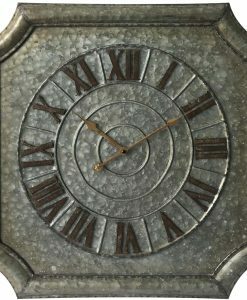 Slate Iron Aluminum Wall Clock 9.5 in. 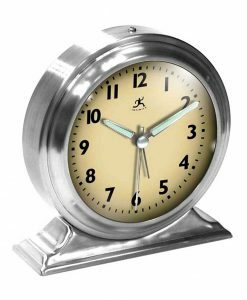 Retro Harbor Mist Grey Aluminum Wall Clock 9.5 in. 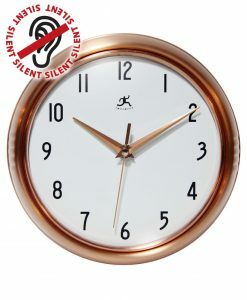 Classic Copper Wall Clock 10 in. 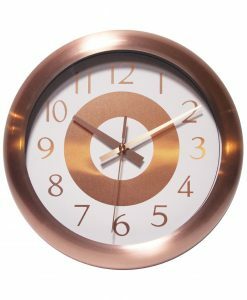 Retro Copper Aluminum Wall Clock 9.5 in. 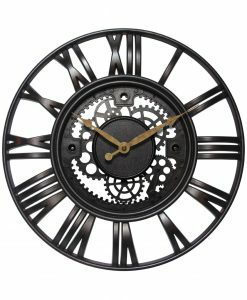 Metal Fusion Black Steel Wall Clock 28 in. 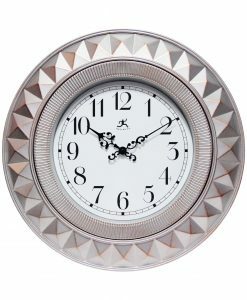 Kaleidoscope Multi-Color Steel Wall Clock 24 in. 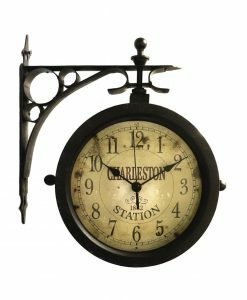 Charleston Black Steel Wall Clock 12 in. 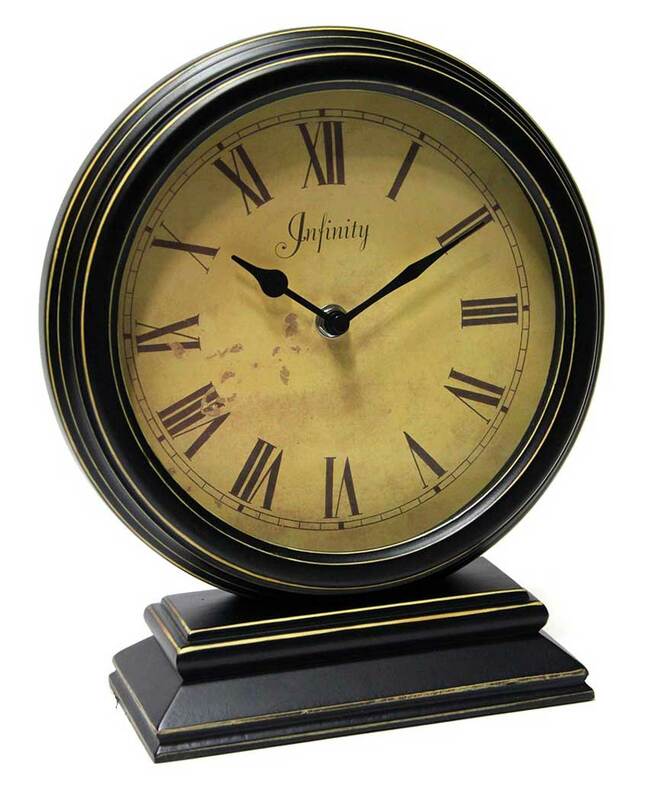 Aged Silver & Gold Resin Wall Clock 15.5 in. 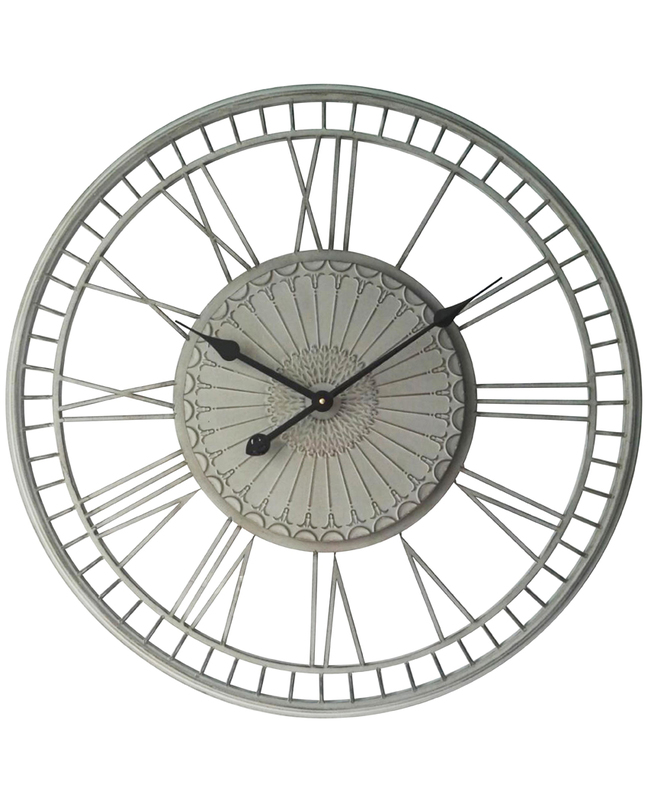 Country Lace Grey Metal Wall Clock 27.5 in. Tree House Blue Wood Wall Clock 23.75 in. 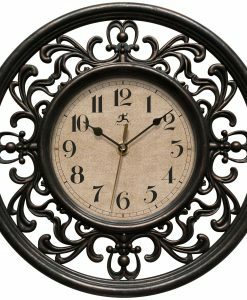 Quatrefoil Black Gold Metal Composite Wooden Wall Clock 23.75 in. 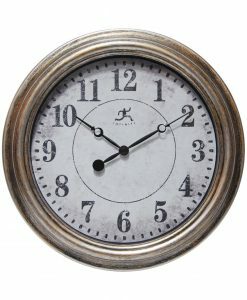 Stamped Metal Galvanized Metal Wall Clock 22.75 in. Procession Black Gold Resin Wall Clock 15.5 in. 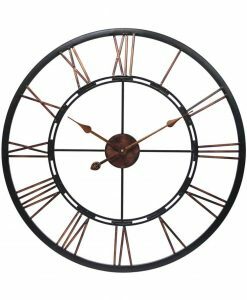 Micro Fusion Black Metal Wall Clock 13.75 in. 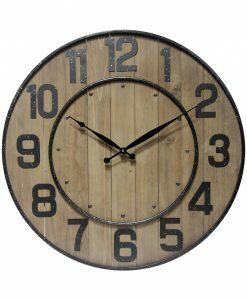 Wine Barrel Brown Wood & Steel Wall Clock 23 in. 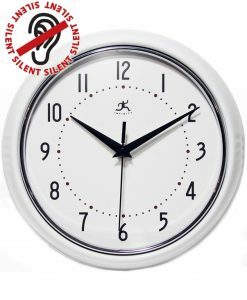 Silver Wall Clock 18 in. Vintage 1886 Beige Wood Wall Clock 13.5 in. 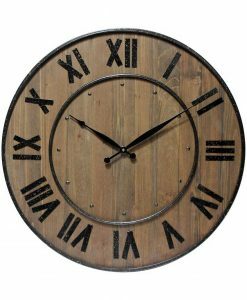 The Dais Black Wood Tabletop Clock 10.25 in. 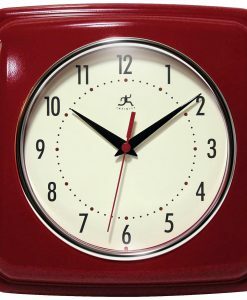 Square Retro Red Wall Clock 9.25 in. 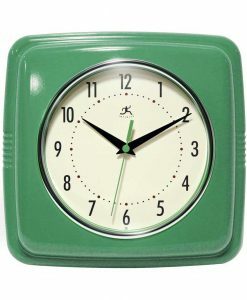 Square Retro Green Wall Clock 9.25 in. 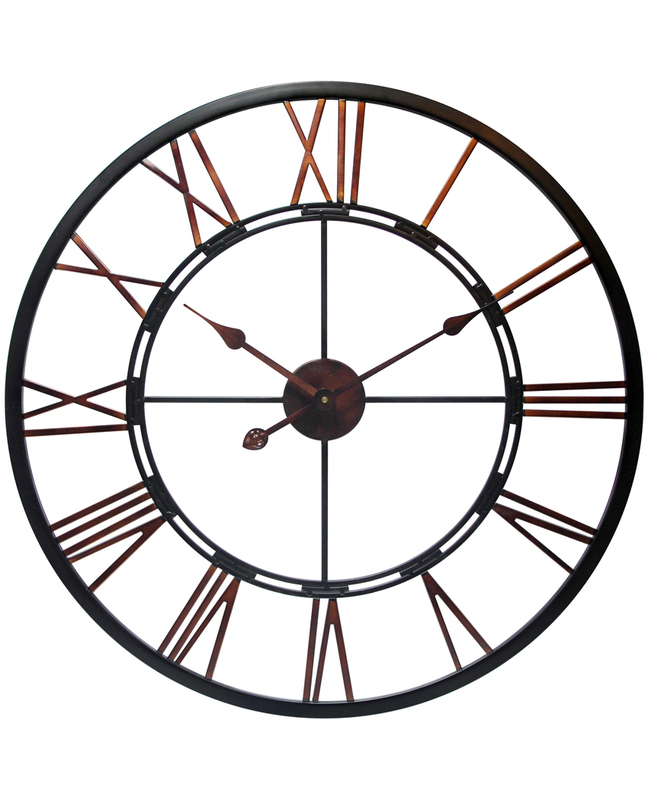 Sofia Brown Wall Clock 12 in. 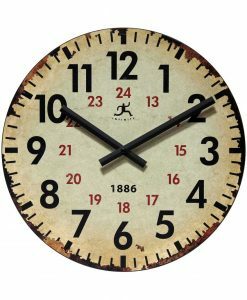 Roman Gear Rust Wall Clock 15 in. 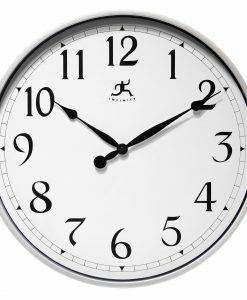 Retro White Aluminum Wall Clock 9.5 in. 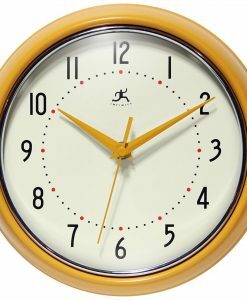 Retro Turquoise Aluminum Wall Clock 9.5 in. Retro Silver Aluminum Wall Clock 9.5 in. 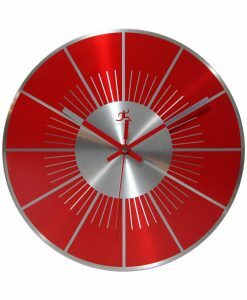 Retro Red Aluminum Wall Clock 9.5 in. Retro Orange Aluminum Wall Clock 9.5 in. 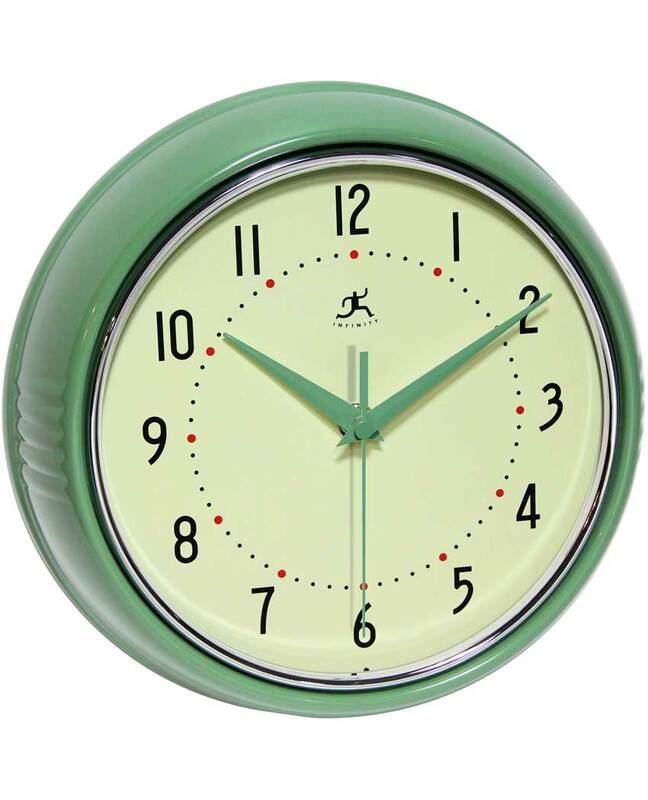 Retro Diner Green Steel Wall Clock 8.5 in. 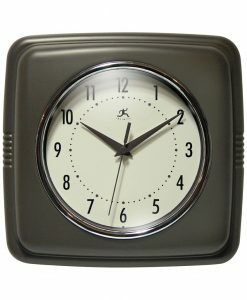 Retro Black Aluminum Wall Clock 9.5 in. 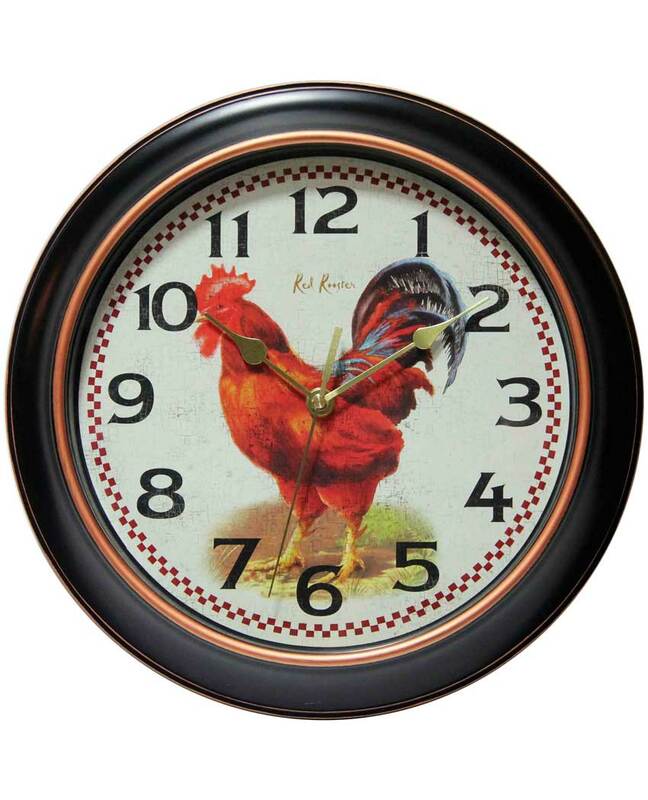 Red Rooster Black Wall Clock 12 in. 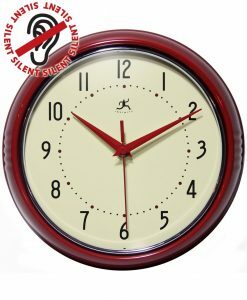 Red L.P. Aluminum Wall Clock 12 in. 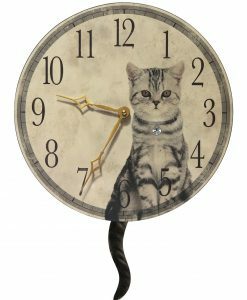 Purrfect Timing Beige Wood Wall Clock 18.5 in. 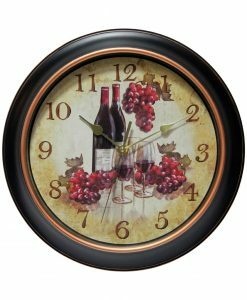 Pinot Black Wall Clock 12 in. 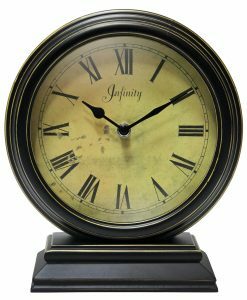 Boutique Silver Steel Tabletop Clock 5.75 in. 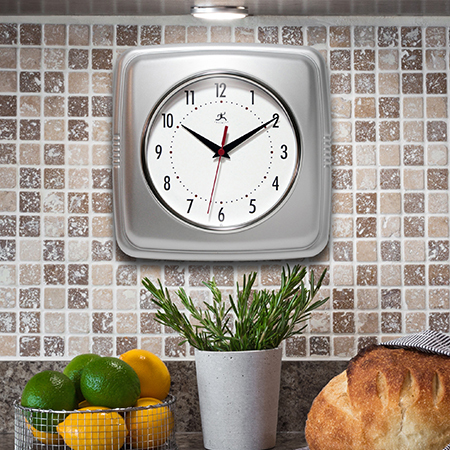 Clock by Room is your best source for kitchen clocks. We carry a variety of styles that are sure to appeal to almost any style. 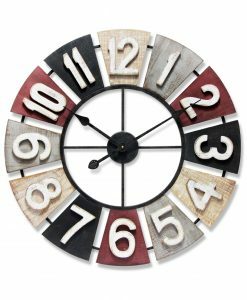 Whether you are looking for something traditional to put the finishing touches on your kitchen or a vibrant retro clock to take you back in time, we have what you need. Browse our wide selection to find your next kitchen clock. Our easy-to-use filtering system makes it a breeze to quickly sort through our selection. Remember, any order over $49.00 ships free! Feel free to also check out our Amazon profile here.